This autumn the Stedelijk Museum organizes a series of gallery talks on the occasion of the exhibition Lily van der Stokker – Friendly Good. The gallery talks are an opportunity to engage with an exhibition at a deeper level, under the guidance of an expert. The third speaker is Kinke Kooi. She will guide visitors along a personal selection of artworks from the exhibition. In the autumn of 2018, the Stedelijk presents the first museum retrospective of Lily van der Stokker, featuring drawings and wall paintings dating from the late 1980s to the present. Some of the works were never shown in the Netherlands before. Friendly Good shows exuberant, decorative drawings and monumental wall paintings. Without irony or cynicism Van der Stokker refers to beauty, friendship and kindness, but also to everyday activities such as cleaning. 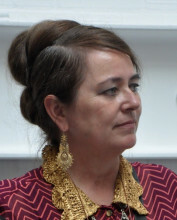 A characteristic of Van der Stokkers work is the unique position it occupies within the tradition of feminist and conceptual art: her work does not conform to prevailing norms about good taste. As such, she often exploits concepts that are ‘banned’ from contemporary art, such as the frivolous and decorative, making her art look sweet and innocent at first. The visitor who will have a second look, however, will discover that Van der Stokkers work contains a much more layered and committed message. These seemingly charming works contain a clear critical message, aimed directly at the viewer. Can artists show failures? Is it alright for art to be untrue and ugly? Or funny and sweet? Kinke Kooi attended the Academy for Visual Arts in Arnhem, and she still lives and works there today. In her drawings, she magnifies small and subtle subjects to a size that turns observation into a haptic experience. Her work elevates themes such as being amenable, being civil, being supportive, and being hospitable. Her work has been included in museum collections in the Netherlands (e.g. Museum Arnhem, Museum Boijmans van Beuningen, Rotterdam and the Rijksmuseum) and various private collections in the United States, where she has exhibited regularly since 1995. The Lily van der Stokker - Friendly Good exhibition has been realized thanks to the generous contribution of the International Collector Circle and the Curator Circle of the Stedelijk Museum Fonds.